Parental alienation is the process, and the result, of psychological manipulation of a child into showing unwarranted fear, disrespect or hostility towards aparent and/or other family members. Parental alienation syndrome was a term coined by child psychiatrist Richard A. Gardner drawing upon his clinical experiences since the early 1980s. ... Its primary manifestation is the child's campaign of denigration against the parent, a campaign that has no justification. In Dr. Richard Gardner's second edit of parental alienation syndrome, he defined PAS as "a disorder that arises primarily in the context of child-custody disputes. Its primary manifestation is the child's campaign of denigration against a parent, a campaign that has no justification. Put simply, parental alienation is child abuse. ... Parental alienation is a set of strategies that parents use to undermine and interfere with a child's relationship with his or her other parent. 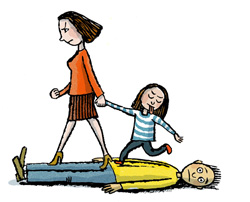 This often but not always happens when parents are engaged in a contested custody battle. Effects of Parental Alienation - WHAT IS PARENTAL ALIENATION? There are many great articles and books written by some fantastic minds about Parental Alienation. I recently published a blog post that explained in great detail what parental alienation is. You can read the full post here; WHAT IS PARENTAL ALIENATION. For those of you that do not know what parental alienation is, it is basically the intentional or unintentional act of turning a child against his or her other parent. This can be carried out in a physical nature such as refusing contact with the other parent by simply refusing phone contact or even interfering with custody visitation. Often times an alienator will also seek to emotionally exclude the other parent through manipulation, brainwashing, and other malicious tactics, designed to align the child with the alienator as the primary source of the child’s emotional well being. While this isn’t always the case, research statistics have found that this act of abuse is almost always directed toward a non- custodial parent, by the custodial parent. The sobering and sad results of such acts often causes long term, damaging effects for all that are involved. Feel FREE to contact me with other resources you wish to add to this section, or simply 'Tell You Story'!